Argonaut Ensemble perform Olga Neuwirth’s Maudite soit la guerre. Photo by Marty Williams. Olga Neuwirth provokes fresh artistic perspectives by combining the new with the old. We see the patchy restoration of the Belgian silent film “Maudite soit la Guerre” (“Accursed be War”, dir. Alfred Machin, 1914), but accept it due to a live music that pits episodic tunefulness against a soundscape of slipping tonal certainty. The trick to understanding this is to place the sound at the focal point of our attention so it becomes the narrative, and the pictures become the incidental. Music can perform this shift very well because its abstraction leaves you imagining a world beyond the visual. The chamber orchestra replaces the organ accompaniment of old: “You always need to remember the past! That is the only way that we could learn something,” says Neuwirth in an interview with her publisher Ricordi in 2014. As I walk from the Ulumbarra Theatre’s converted gaol toward the Rifle Hotel, I’m already thinking of the Syrians arriving in Europe. Of our collective responsibility. And guilt. Neuwirth is a step ahead because her sound world provides us with a more satisfying ultimate redemption than that of the colourised celluloid. In the film story itself, Adolph furthers his training as an aviator by visiting a country that looks and feels like Belgium or France. Honky-tonk piano clanks while the harmon-muted brass crack wise and jostle with colleagues as they meet at the airfield. New-fangled flying machines are being inspected, and as the string harmonics are slowly replaced by concentric sustained cowbells, we are taken to the tavern three months hence as Germany declares war. The declaration means that Adolph and his new friend Sigismond are now enemies. Even though Adolph has fallen in love with Sigismond’s sister Lidia, he must now return to the Vaterland to take up arms. The melodrama thickens; a grave clarinet turns upon itself alongside forward marching brass and above the strata of an elbowing organ and stringed hums. A mistuning of signals is now more pronounced—the sample track and whimsical electric guitar are prompting us to reconsider earlier impressions. Blood red explosions are sighted through binoculars as the world is turned upside down. Adolph hallucinates that his sweetheart appears as the suddenly more menacing and now armed flying contraptions lurch and veer above. The percussionist stings the enemy with rapid gunfire and a harrowing sequence follows where hot air balloons are attacked, catching fire and eventually caving in on themselves. These are the corpses; war is indeed cursed. Neuwirth tells us with a further splaying of the tonal focus that another pivotal scene is nigh. A telegraph communiqué is sent via elevated strings and leads to the windmill where Adolph is hiding being set ablaze and collapsing. Lover and girlfriend’s brother emerge from the opposing sides and are both slain on the battlefield. Cut to a year later and the lieutenant who brought the grim tidings to the family is making a play for the now single Lidia. Love is in the air until she spots her lover’s medallion pinned to his uniform. She convulses and contemplates drowning herself but instead retreats to the convent. We hear a veiled Bach chorale (could it be “A Mighty Fortress Is Our God”?) and later a Stravinsky-like “Jesu, Joy…”. By now the sample track and the orchestra are worlds apart and the last vocal echoes shimmer a little longer beyond the church and greenery. Eric Dudley’s conducting magnificently disguised the presence of his in-ear click track and the Argonaut Ensemble was precise and fluid. I was not convinced that the sound design and amplification recognised the subtle internal dynamics of the acoustic ensemble. The strings and bright percussion occasionally dominated in the mix, leaving some of the delicate muted brass and guitar layers behind. 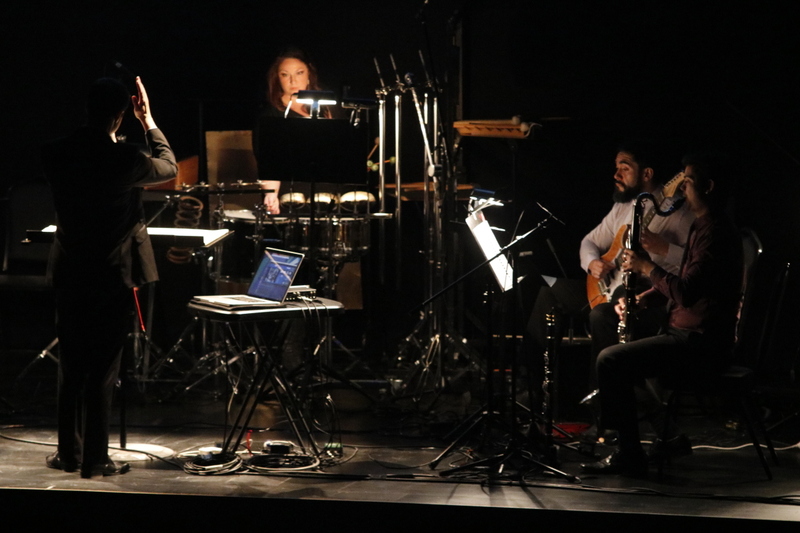 The sophistication of the writing and interpretation created an extraordinarily poignant opening to the 2015 Bendigo International Festival of Exploratory Music.